Only four people live within the walls of Sortelha, one of the 12 historical villages in Portugal. Yet, this is one of the most beautiful and ancient Portuguese villages, attracting visitors from Portugal and abroad. There are many reasons for this magnetism. The urban and architectural landscape is immaculate. Nature surrounds you in an inspiring way. History is everywhere. There is a 13th century castle, several traces of medieval architecture, a 16th century pillory and a renaissance church. And the best part is that with so many traditions and heritage to discover, it is the present moment and its absolute fruition that make this place so magical. Located in one of the country’s most amazing natural regions – the Beiras, in the centre of Portugal – Historical Villages in Portugal are not far from the Serra da Estrela Natural Park. It is a flawless, inviting setting. Visitors can enjoy long strolls along the numerous walking routes (there are 51, connecting the historical villages), or explore the rural trails biking among the blossoming cherries and fragrant peach trees. Panoramic views from medieval castles on top of hills are always breathtaking. Inside the castles’ walls, you can discover old districts, marvel at the architecture and taste some of the most traditional, and tastiest, products in the area. The cheeses, wines and olive oils of the central part of Portugal are all excellent. The almonds and cherries, too. 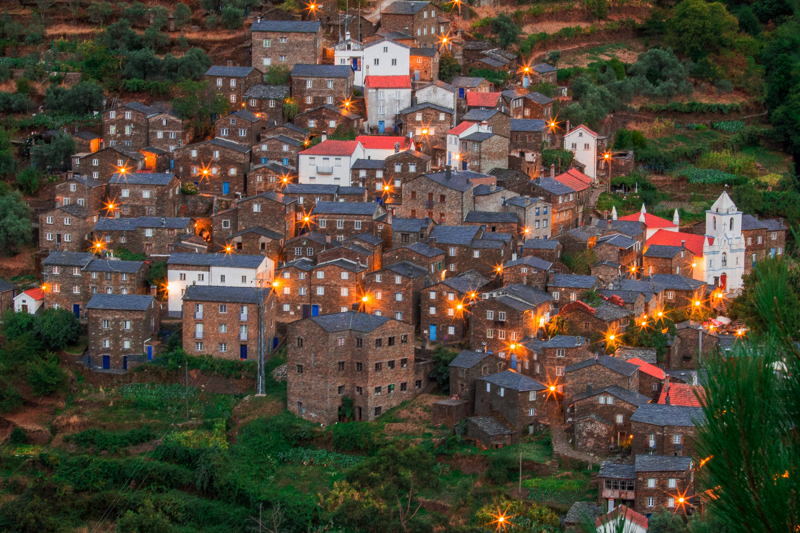 Historical Villages in Portugal are also the place where crafts traditions are still alive. Don’t miss it! Almeida, Belmonte, Castelo Mendo, Castelo Novo, Castelo Rodrigo, Idanha-a-Velha, Linhares da Beira, Marialva, Monsanto, Piódão and Trancoso. These are the 12 gems that form the network of Historical Villages in Portugal. Set in the highlands of the center region, many of them were founded even before Portugal emerged as a country. And this was a long, long time ago, since Portugal has the oldest stable borders in Europe. Strategically placed next to Spanish border, Historical Villages in Portugal may be small in size, but they have a played a major role in defending the country. Many generations of Kings have understood the importance of these enclaves and decided to fortify and populate the area. Now the castles remain, and the locals are known for their hospitality, always welcoming visitors with open arms and a kind heart. Historical villages have always existed. With their walls and citadels, their legends and their stories, their traditions, crafts and gastronomy. But it was not long ago that they were rediscovered. Behind the rebirth of the Historical Villages in Portugal is the Aldeias Históricas association, which has built a network for the development and appreciation of the Historical, Cultural and Heritage values of the region. Together, they have done an immense job. What at first seemed like public works – like recovering façades and house roofs, urban developments, improving accesses and benefiting monuments – turned out to be a symbolic endeavor. The idea, they explain, is not to time-travel to the past, but to bring the past into the present. In the historical villages in Portugal, an amazing blend of nature and culture emerges, and past and present coexist. Belmonte has a centuries-old history, which echoes the diversity of Portugal’s culture and traditions. This historical village in Portugal, offering wide views to the Serra da Estrela, is known for its treasured Jewish heritage. Belmonte is home to one of the most important Jewish communities in Portugal and its synagogue and Jewish Museum (the first in Portugal) are unmissable. Although it is 125km away from the sea, Belmonte is the hometown of a famous Portuguese navigator, Pedro Álvares Cabral, who discovered Brazil. This explains why there’s a museum dedicated to the Age of Discoveries. Exploring the material and symbolic identity of each historical village in Portugal was the goal behind the creation of the network. By planning your trip to the Historical Villages in Portugal with Episode Travel,you will be able to handpick your activities and completely tailor-made your visit, creating the perfect experience for you. We will help you find the best places to stay, create the greatest food and wine experiences and prepare the perfect itineraries and activities to make the most of your stay. Discover the charm of Monsanto, which has been described as an island in the midst of the fields, with its superb views and picturesque streets. Or Marialva, an historical village which has grown on the outskirts of the castle, where noble houses were built, closer to the agricultural properties. Or Castelo Mendo, which seems to look over and protect the Côa River, a medieval fortress with a superb panoramic view. All around you, the vineyards, olive trees and almond and cherry trees in bloom remind you that the splendor of nature is as captivating as the richness of history.